This class is an extremely broad overview of Cooking Techniques for the beginner. It is one of four classes (the others being Knife Skills 1, Stocks and Soup, and Cooking Techniques Basics) we recommend that anyone who has limited time and resources should take to be a better cook. That being said, this class is a part of our Culinary Certificate program. It is open to everyone to attend. If you would like more information about our Certificate program, please click here. 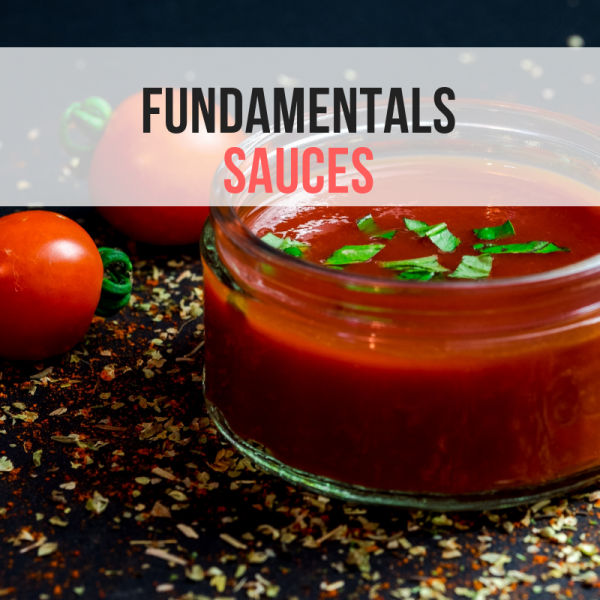 In our Sauces Fundamentals class, you will learn basic items to keep in your fridge, freezer, and pantry in order to make delicious meals at any time. You'll also learn how to make classic mother sauces to manipulate into small sauces and basic vinaigrettes and dressings that will make you never want to buy store bought dressings again. We'll also discuss some great kitchen equipment every good chef should have to complete meals that are beautiful and tasty enough to serve to the finest of company or for just everyday. This class is great for those looking to add flavor and excitement into their meals - a great foundation for all cooks, new and old. Using sauces takes you to the next level of cooking. Learning sauces also really teaches you how to taste! Also, how to adjust your food so that is goes from dull and boring to something so much more interesting. We're so confident you'll learn more than in any other class offered by the competition that we guarantee it or your next class is on us! My wife and I went into this class not knowing what to expect since this was our first visit to Well Done. I thought going in if I just learned one thing I didn't know before it would be a success. I way underestimated the level of skill and information the two instructors, Celeste and Leslie exhibited during our time there. They both took the time to explain and didn't rush those of us who weren't up to speed with the latest Espagnole or Béchamel sauces.